Among what are technically known as “internet freaks,” it is an immoral and devious sin to steal a picture from a website, only to post it on your own page without giving the original site credit. Well, I only steal from second and third-hand sources, so I can’t tell you the original site. And I’m certainly not giving credit to those thieving hacks. The authenticity of internet photos is speculative, but, regardless, their content can be excessively provocative. 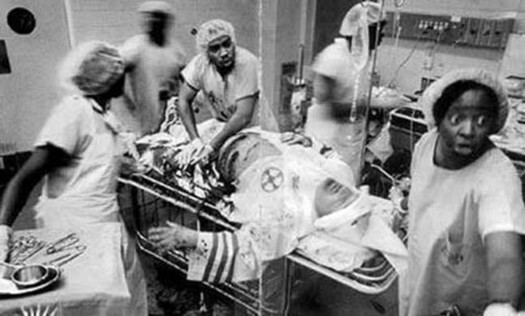 Whether this is a real photograph of an ironic event in human history that captures members of the medical profession calculating potential gain while, simultaneously, showing a man dealing with a racial dilemma OR a fake, Photo-shopped print showing the same thing, it still gets the viewer’s brain pulsing. Such photos need to be shared with the right people. I believe you are those people. I was walking down the street and I saw this middle-aged Asian man standing in the doorway of his home. He was just standing there, the door wide open, and he was watching his puppy play in the little strip of grass that ran along the sidewalk where I would soon be walking. As I got closer to the dog, it saw me and, then, held completely still. I kept walking. I walked right passed the puppy. And then, as I was about ten feet away, I turned around to see it still staring at me, frozen in position. As I caught eyes with the beast, that’s when it bolted right for me.